Weighing in at a peak 70+lbs (Washington state sport record), the Chinook or “King Salmon” is the regions ultimate trophy fish, and one of the reasons that Seattle Washington King Salmon Fishing is considered some of the best in North America. Chinooks sport blue-green backs, silvery sides and white bellies. Their tell-tale black mouth coloration often lead to smaller Kings being nicknamed “Blackmouth”. 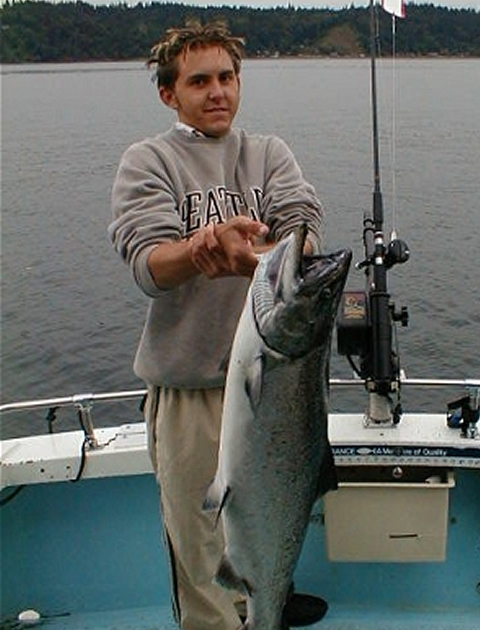 The fish will usually achieve an average length of about 36 inches or so and a weight near 30 pounds, though Kings can get much bigger, up to 58 inches in length, with some tipping the scale at well over forty pounds, no wonder the King continues to be the hallmark of the Seattle Washington King Salmon Fishing experience. The Ocean going King is a stout robust fish sporting a bluish green back to the aforementioned silvery sides. It is during the spawning season that these mighty fish sport their breeding finery running a broad gamut of colors from red, to copper to black. Like many of their fellow salmon species the Chinooks jaws and nose also take on an unusual appearance, becoming hooked and malformed. With a Washington state sport record of over 70 lbs, Seattle Washington King Salmon Fishing is considered some of the best in North America. Seattle King Salmon are the most rare of the Pacific Coast Salmon, and are eagerly sought after by anglers. 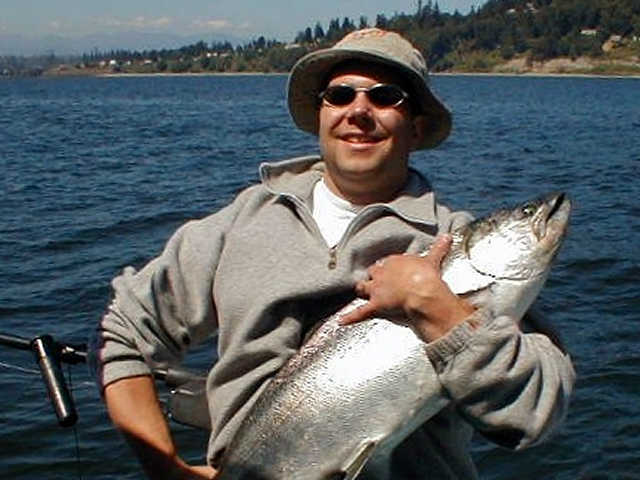 Anyone who lands a substantial Seattle King Salmon will not soon forget it. Chinook fry typically remain in freshwater for anywhere between one and eighteen months before making their trek downstream. A king will spend anywhere between one and eight years at sea before making their final trip home to spawn, returning to their native fresh water rivers and providing the opportunity for anglers to pursue the hallmark of Seattle Washington King Salmon Fishing. The King are rightfully considered one of Seattle Washington King Salmon fishing’s most sought after delicacies as these giant fish feed extensively before their spawning runs and as a result the king salmon provides a rich and satisfying eating experience that is a welcome treat gracing many a Puget sound barbeque in the summer months. 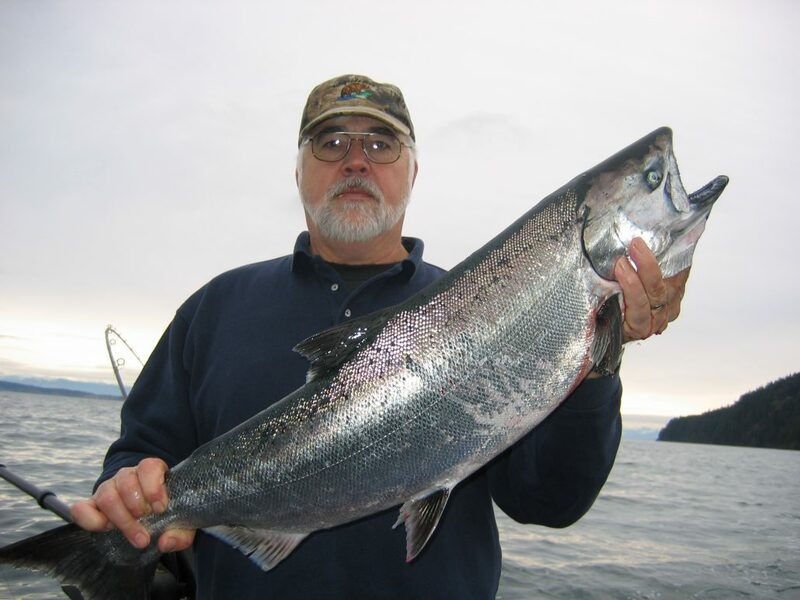 All Star Fishing Charters guide Gary Krein is considered one of the best Seattle Washington King Salmon guides. Take advantage of Gary’s years of experience and let him host a trip to some of the regions richest and most exciting fishing grounds, you will be guaranteed a day of fishing that will rival the greatest fishing experiences of your life. Call ‎206-316-6561 or click Book Now to get your chance at one of the Kings. Washington King Salmon feed extensively before their spawning runs and as a result the Seattle King Salmon provides a rich and satisfying dining experience.